An ultimate token management plugin with amazing features. TokenManager is a simple economy plugin with fully configurable shops, sell hand command, worth command, top command, and much more. [+] Highly simplified commands & permissions. [+] Automatically updating configuration files with highly detailed comments. [+] MySQL support! Cross-server token balance syncronization. [+] Support for offline mode servers. [+] A useful API for developers. [+] Vault support. You can use TokenManager as your server's economy! Thanks for downloading my resource! Found an issue? Join my discord to get it fixed as soon as possible! kassad, DeadMaster, Mezo and 10 others like this. Great and a perfect plugin! However, the newest update for 1.13.2 requires an update to connect to vault. 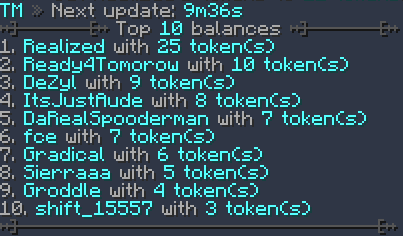 All these new economy plugins aren't working except for 2 of them, in which token manager should be updated to the new vault for 1.13.2 thank you! [13:59:37 INFO]: [TokenManager] There was an error while loading DataManager! If you believe this is an issue from the plugin, please contact the developer. [13:59:37 INFO]: [TokenManager] Cause of error: Server is in ONLINE mode, but found table 'tokenmanager' does not have column 'uuid'! Please choose a different table name. [13:59:37 WARN]: java.lang.Exception: Server is in ONLINE mode, but found table 'tokenmanager' does not have column 'uuid'! Please choose a different table name. It mentions why it doesn’t work. Looks like you’re trying to connect to an offline mode table when your server is in online mode. 15:17:46 INFO]: [TokenManager] Cause of error: Server is in OFFLINE mode, but given keys were not a valid NAME! [15:17:46 WARN]: java.lang.Exception: Server is in OFFLINE mode, but given keys were not a valid NAME! Stop your server, remove data.yml and it should work. Make sure you have the latest version of MVdWPlaceholderAPI and FeatherBoard. Extremely useful plugin! I use it as a premium currency on the server. I really hope for further development of the project. Hi, thanks for the wonderful plugin. I have a question: can I post a translation of your plug-in on a Russian-language forum? As long as you credit this page, sure. Everything you need for a duel system. Award duel winners with a certificate item!